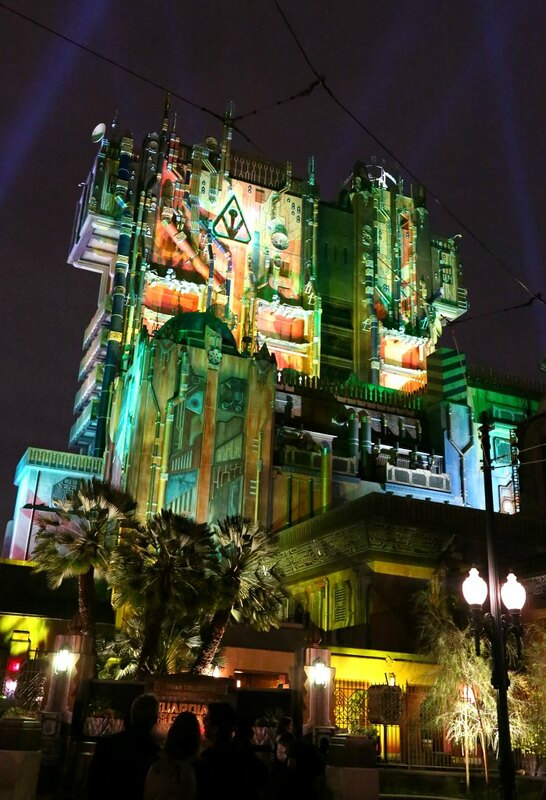 7 Reasons to Ride Disneyland’s Guardians of the Galaxy – Mission: BREAKOUT! The ride queue on the outside has a few fun details and things to find, but this interactive queue really shines as soon as you enter the building. 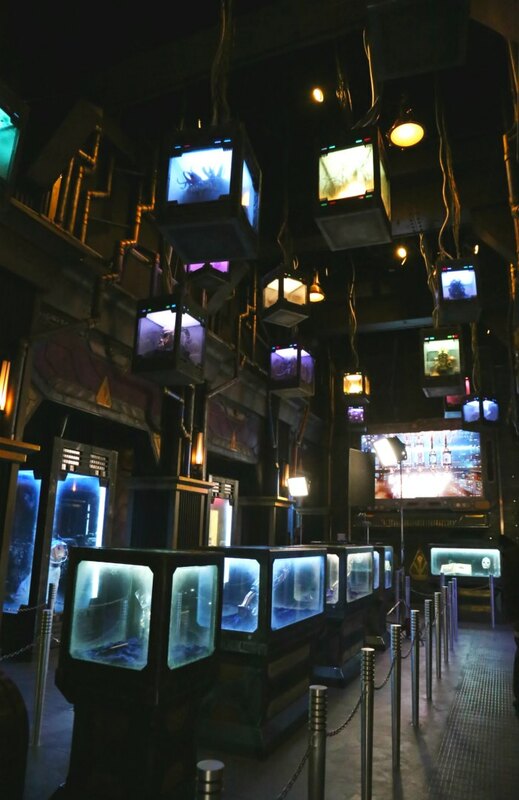 There, you’ll stand inside the Collector’s Fortress lobby where there are some strange and wonderful artifacts on display. The queue wraps through the lobby, so visitors can really get a good looks at the different items! You’ll also watch an introduction to the experience where Tivan shows you his most prized possessions. And in true Guardians form, there are quippy jokes & banter as they argue with each other. This helps sets up the storyline for the ride. Then, you head into the Collector’s private office. 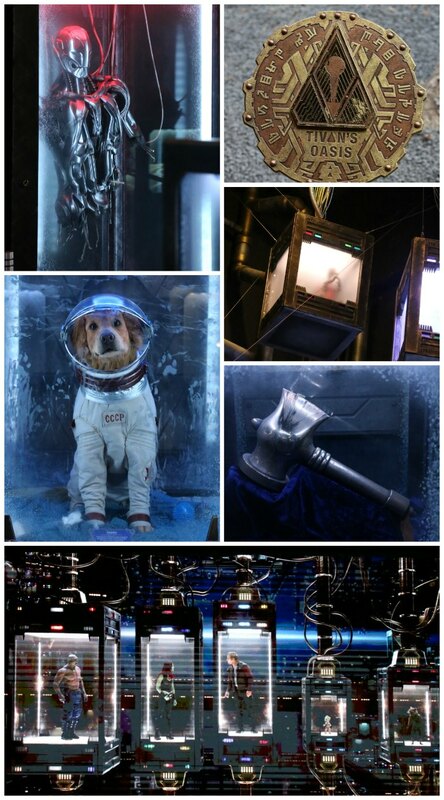 Not only are there an incredible amount of items in the cases in the room, but you’ll find Rocket here (a VERY well-done animatronic) and he’ll tell you what needs to happen to free the Guardians. With over 2,000 Easter Eggs as part of the Collection, they are EVERYWHERE! Both die-hard Marvel fans and classic Disney fans will love looking for special items. It was suggested that there may even be some clues about upcoming Marvel projects! See if you can find Figment, Harold (the original Yeti from Matterhorn), old Disneyland maps, original items from Tower of Terror, and more! The Collector really has snagged some interesting things! 😉 AND…then there’s the whole alien language throughout. It’s clear the symbols match up with letters. I have a feeling that if you can crack the code to translate, there may be some interesting information on certain plaques and labels! Anyone who has seen either of the Guardians movies knows there is a different “vibe” with those movies. There’s all the action & adventure you get in every super hero movie. But, it’s combined with a certain level of comedy, irreverence, wit, and sarcasm that we don’t see as much in the other Marvel films. 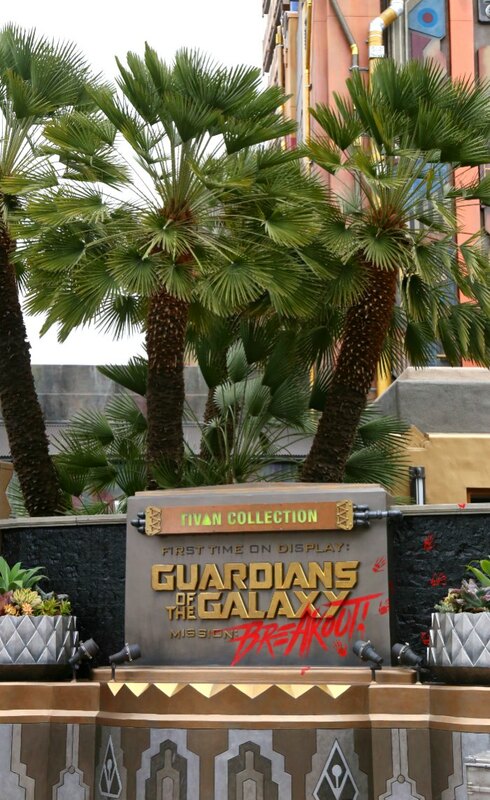 Imagineers worked closely with James Gunn (director of the Guardians films) to create the ride, staying true to the characters and the mythology. So, fans of the franchise (and even people completely new to anything Guardians) should all catch & like the Guardians vibe in the ride with that comedy and energy they bring. Not only is this ride one-of-a-kind in that you can ONLY find it at Disney’s California Adventure park, but the ride itself has 6 different possibilities for guests to enjoy! 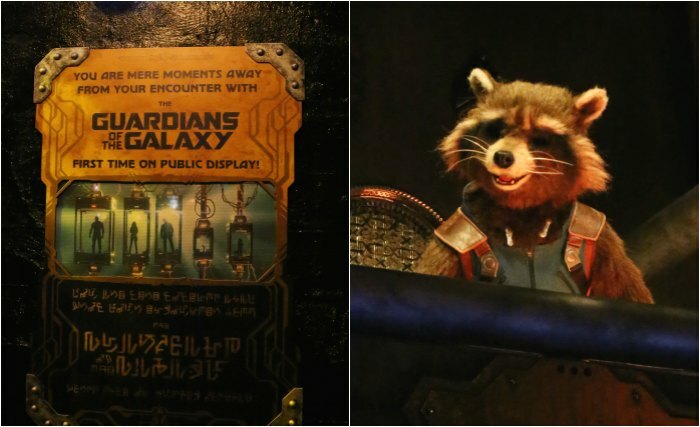 So, until Rocket pluds in Star Lord’s walkman, you have NO idea which ride sequence you’re going to get. Each of the 6 ride sequences feature a different up-and-down ride profile and some different story scenes, accompanied by some great Star Lord approved tunes. During the press trip, I had the pleasure of riding 11 times and I’ve experienced 4 of the 6 tracks (I still need “I Want You Back” and “Burning Love”). And I can say that waiting to see which song you’re going to get is part of the anticipation of the ride! The music also helps to create an even more fun ride experience! And, while the ride itself has WAY more thrills (in terms of speed, drops, overall “thrill factor”), I think the theming of the ride is WAY better for families. My kids are little and the name of “Tower of Terror” alone made the ride scary. There were SO many times I witnessed kids just absolutely scared to death on that ride (you know – something about people DYING in an elevator definitely is a scary thought). 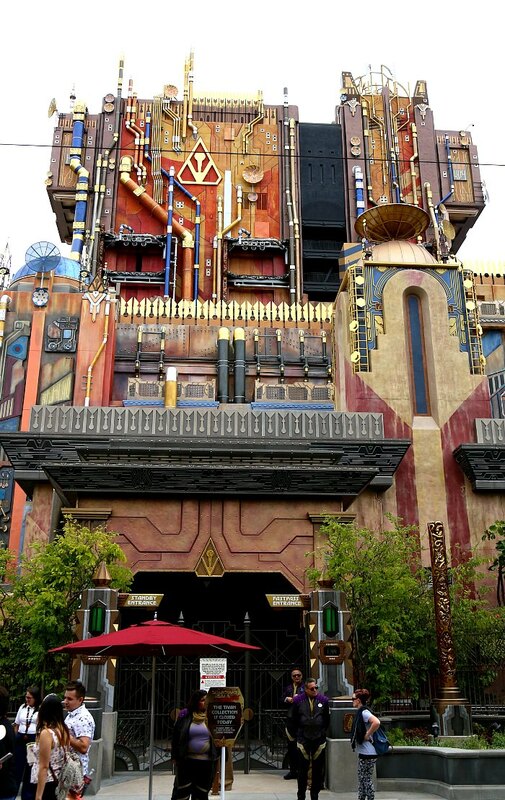 So, I really like the lightheartedness and fun-factor that the Guardians ride brings! I’m not even a mom who has let her kids SEE the actual Guardians movies just yet, but the ride is GREAT! Perfect for the whole family. I canNOT wait to get the whole family back to Disneyland to ride this! So…What do YOU think?! Are you excited to ride this? Have you ridden this already?! Tell us in the comments below! If you’re excited about this one, I recommend getting to the park before rope drop and planning on heading straight to the attraction. There, you may be able to enjoy a short stand-by line and then get your Fast Passes for another ride time as well! That’s going to be your best strategy for being able to ride at least twice (without waiting in super long lines)! To save money on your trip to see check out the new Guardians of the Galaxy Attraction, consider booking through Get Away Today! That’s who we use to book our trips and so we’re thrilled to partner with them as an affiliate! They love Disney and really make the whole thing so easy, as well as being great about getting you the best deal! You can even start planning for next year’s holiday season with their great layaway plan! 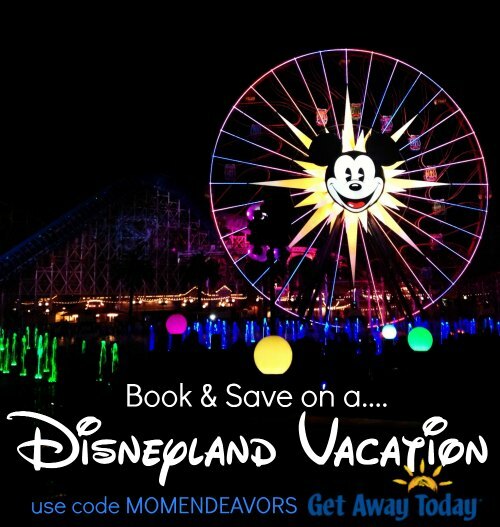 Plus, use our exclusive Get Away Today coupon code: MOMENDEAVORS to save even more off your 2-night or longer Southern California vacation package!